Happy Sunday! Welcome to Technique Tuesday's Studio AE's July blog hop. So excited to be a part of this! 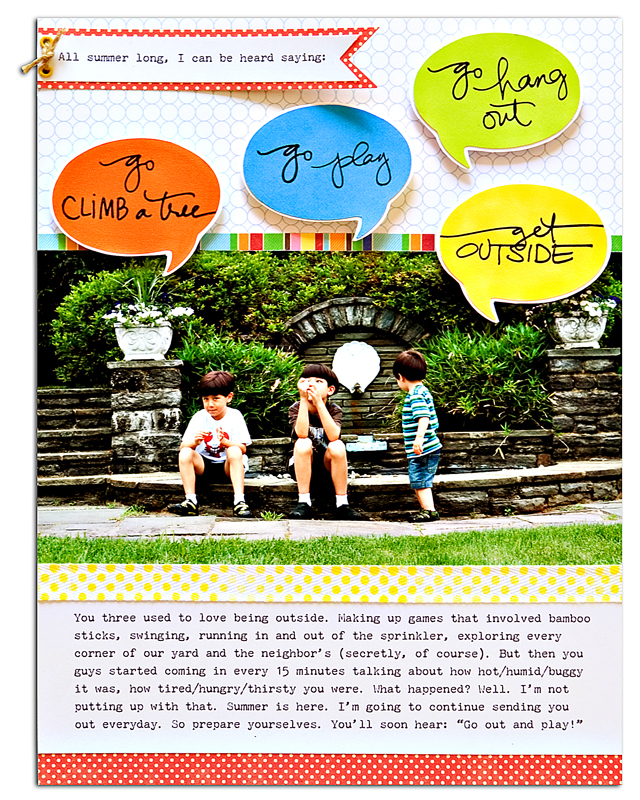 This month's stamp is the very versatile Get Outside by Ali Edwards. You can get your very own set here. For a peek of the stamp and my other layout using the fun stamps, go here. Today's layout is the companion story to my last project. It tells about our love of the outdoors. Specifically, it's about a nature trail we visited regularly in Pennsylvania. It was tucked away in the middle of a residential neighborhood, next to an elementary school, and totally magical. Beautiful light filtering through the leaves, interesting looking weeds with strange flowers, a swishing creek running through it, flat rocks waiting to be skipped, and a monumental climb to the top of what my kids called "Monkey Rock." At the top is where I, breathlessly, promised myself (many times) that I'd start exercising. Ha. For this project, I used the stamps as they were. (I cut some apart for the other layout.) I printed the photos in strips, then added some journaling, some punched elements, some stamping, some grey and yellow, and some sewing. I really enjoy hand sewing on my projects! For the flower, I used a Fiskars flower punch, creased it a bit between the petals and added french knots in the middle. I also sewed some freehand swirls for the bugs. And that is it! And don't forget to leave me a comment today for a chance to win Smooch by Ali stamp set. From all the comments received during the hop on all 7 blogs, Technique Tuesday will pick two people to win the set. 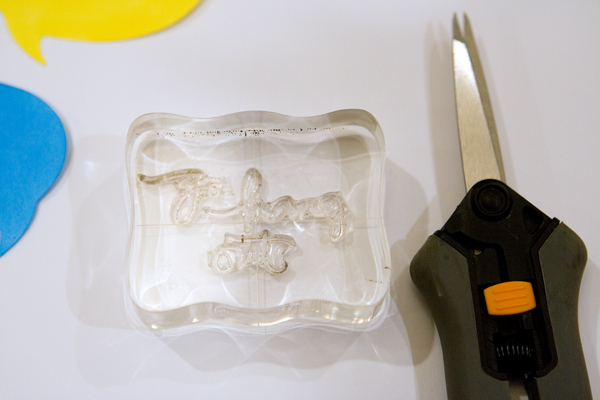 You’ll also want to stop by the Technique Tuesday blog to see a special project from Bev, Technique Tuesday’s founder and CEO. Leave a comment about the blog hop there. Bev will pick someone who comments on the Technique Tuesday blog to win the A Date with Ali stamp set. So fab. I want it! All comments must be made by midnight PST on July 12th. Tune into the Technique Tuesday blog on July 13th to see if you are one of the lucky winners. Thanks so much for coming by! I'll be sharing another Studio AE project later this month. Firstly congrats on being the guest designer for July...love your beautiful layout...the simplicity of it with the punches of colour and stamping makes it the perfect creation...love it! Hugs! love the layout and color combo ... not to mention the AE stamp set! thanx for the inspiration and blog candy opp! congrats on being Ali's guest. I really like the layout! I like the idea of printing the photos in strips. Never tried that. Thanks for the inspiration. Thanks for the blog treat! Just 'found you' around the time of your move. Love your layout. The stamping is just perfect and I love the flower accents. 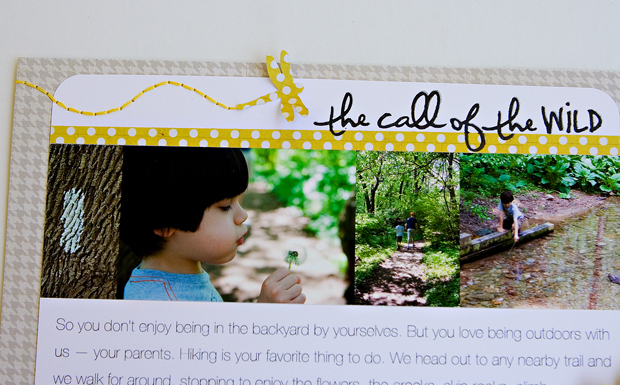 Such a sweet layout...love the pops of yellow! What a great layout. And how you used the stamp from Ali. This is a charming layout. I appreciate the simplicity that highlights the wonderful photos and tells a wonderful story. Thanks! Love the layout with the bugs, flowers and strips of prints. Congrats on being the guest designer for July. Congrats to you darling you most certainly deserve a guest spot! What a sweet layout. loved the layout! Thanks for the insiration! What a great LO! Love the pop of yellow like that! Beautiful layout, great way you used the stamps. Thanks to Ali, I've discovered you and like your style! Thanks for the opportunity to win the stamp set. What a lovely page!! And yay for being a guest!!! Love this!! I'm so in love with these stamps! Love your use of Ali's stamps! Love your layout. Beautiful color combo for your photos. Glad I'm a member of Ali's monthly stamp club. Actually, no think about it. I love the embroidery accents you added! beautiful! Congrats on being the guest designer this month. What a great layout. So bright and it's calling summer for me. Love the stitching. Congratulations to your GD in July! Great color combination & design! love your layout!! Thanks for sharing it! Love the color combo! The design is fantastic! Wow! What a stunning layout! I LOVE the stitched butterfly trails!! Love the way you displayed the photos. Great LO! Love the colors on your LO. I really like it. I love your page and the fact that you fit so many photos into one page! I can't wait to get that stamp set. I think it will be very versatile. Congrats on your post this month!! Really love the bright colour used and the stitching!! What a great layout! The title goes so perfectly w/the pictures! Your layout is gorgeous. Thanks for the inspiration. I love the little touches you added like the French knots in the middle of the flower. Great layout....love it. The stamp sets are awesome. Such a cute layout, love the theme! I really like the stitching on this--the yellow just "pops"! And the stamp at the bottom is perfect. Beautiful. I need to utilize yellow more often in my layouts. I tend to automatically turn towards pinks/purples for my girls and blue/greens for the boys. Great use of the stamps for both projects - and yep I too tell my two to go outside. I love the stitched butterfly and dragonfly trails! Thanks for the inspiration! Great layout and stamps!! Thanks for the inspiration! Great inspiration with bright color to enhance the word story and photos. Love your layout with all the lovely sweet little extra touches! great stampset !!! Great layout! I like the polka dot embellishments. What a wonderful layout and full of wonderful memories to remember for years to come. I love it and those lovely stamps. I love the pop of yellow on the page! And the happy little butterfly trails make me smile! Love the layout, the colors are great!! love the stamp set too! great addition to a family that loves to be outside!! love the way u have used the stamp- and love the yellow sewing !!! I really love this layout, love the yellow you used with the green of the photos. The AE stamp set fits perctly here, thanks for sharing! Wow, I love your layout. I love it when the stamps work so perfectly with a layout or idea. Have fun as the guest designer! Love that stitching details, and color combo! I love the combination of stamping and stitching on this layout. Beautiful ! 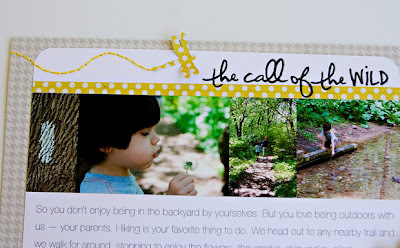 great layout =-- love how the yellow pops off the page! I like the french knots on the flowers. I need to remember that. Most of the time I use buttons or brads. Congratulations on being the guest designer for July. A great layout and fantastic use of the stamps! BEAUTIFUL LO!!! I love the loop d loos in stitching! I will be trying this LO on for size!! :) Thanks for the inspiration! Love your layout and the story behind it. Cute layout - love the colors!! awesome layout!!! Love with you did with the stamp set!! Thanks for the inspiration! This is so, so pretty! I love the hand-stitching and the yellow + gray! Love your layouts, and the way you used Ali's stamp! I love to sew on my layouts too. I am a new follower of your blog, and I look forward to seeing more from you. Congrats on being the guest designer for this month, too! Beautiful LO! LOVE the stamps (of course!) and those pretty bright flowers! How fun to be a guest for Ali. 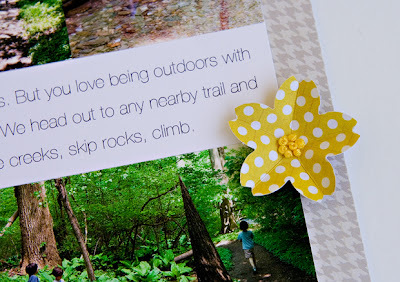 This is so cute and I love the yellow polka-dot paper you used. Great design. Thanks for playing and sharing. Loving the blog hop and seeing new blogs such a yours! Lovely layout!! Perfect page, love all the yellow! Love everything about this layout. THe colors, the design and the simple lines..Just GREAT! Thanks for sharing and CONGRATS on being the guest designer for July! I love your page. So creative. Really great LO - love your use of the stamps and I can't wait unti lmine arrive! I love your layout and how you used Ali's stamps! Thanks for sharing. This is such a cute layout. I love the stitching on it. Great job. Congrats on being the guest designer for July!! And I love your clean layout! Congrats on being the guest designer. Love your layout. WOW - this is such a fabulous page! This is adorable. It's a great layout from a great set of stamps! Keep it up! very cool lo, can't wait to get my set of July stamps! I like the color scheme and usage of the stamps. Awesome job! Love ths stitching and the colours of your layout....wishing my stamps here quicker now!!! Love the layout, the colors, the stitching-and of course, how can you go wrong when you are using stamps by Ali Edwards! Great Jobs! Great layout. I love the pop of the color yellow. Love your LO and the YELLOW!! What fun to be a guest for Studio AE. You did an awesome job. Your LO is very eyecatching! Thanks for sharing! love your use of grey & yellow together, since i had heard it was the 'new' fashion colors. this is such a clean and fabulous layout. i love it and thanks for the chance to win. I love the little butterfly and flower - so happy and surprising. Love the design, colors and details!! fun to see your "take" using the AE stamp set...what fun! I can see this set getting a lot of use in my scrapbooking!!! 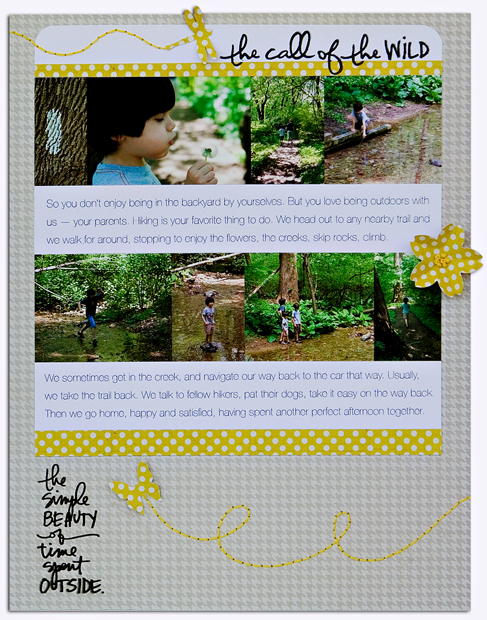 I love the layout, I love the stitching, I love this stamp set, and I love that bright yellow you used on the layout. I love the way you added the stitches to the rest of your design. What a lovely layout. thanks! Love, love the simplicity of your page. Really like the stitching and the punched flower is perfect. love your layout. i love summer-time! and ali's stamp set is perfect for all my summer layouts.! I love the color scheme you used for the outdoor layout. Way to go on being the guest designer! Really appreciate the simple yet artful way of time outdoors and love the Smooch set! thanks for the inspiration. Love your work. Lovely summery feel. I like the way the stitched flight path of the butterfly and dragonfly mimic the smooth, loopy font style. Love your layout! Such great ideas. we spent this whole past week out side while my son & daughter-in-law & 2 grand children were home from New York!!! We had a outside huge birthday party for the kids at a park. One afternoon we made mountain pies, we also did alot of swimming in the backyard!!! I love your page!!! Fun LO! I love the yellow polka dot flower & butterfly. This stamp set is awesome! The french knot in the middle of the flower is such a great detail! Looks like you live in a beautiful area. The pictures are wonderful. What a gorgeous layout!! I love the colors and the photos in strips, and of course, the lovely stamps! Love your layout and the movement with the stiching. Congrats on being the guest designer for July. Love the layout the stitching for the dragonfly trail is simply awesome. Such a fun and sweet layout!! Loved your layout specially the stitching!!! I just love the french knots in the flowers. Great idea. Love the whole layout. You just made me fall in love with yellow! Love your stitching too! Love it! Think I'm gonna case this design - and I have just the pics in mind. I especially like the format you used - it's nice to see a change from the usual 12 x 12 format! thanks for the inspiration. I love how the Ali stamps just pop off the page! Great use of color and your children are adorable. The AE set is perfect. All your details on the page - wonderful! Beautiful layout. Love the bright yellow paper, the black stamping with the lovely photos with so much green! would love this stamp set! Congrats on being the guest desigher.. love your layout--so perfect for summer outdoor activities. Thanks for sharing! Congrats on being guest designer for July. I love the color combo on your LO and usage of stamps of course. Great new set, love how you used it. Outdoor photos were terrific! Love the spot of yellow- perfect for the photos!!! Love the color combination and the stitching or the butterfly and dragonfly. Linda what a great layout. I love the stitching and the color combo, but the AE stamp just put it all together. Love it all! Great layout! I love the butterfly path stitching. The colours really pop too. Your use of the French knots is very striking. Great layout. Great use of the stamp set. Thanks. Fascinating! I love that you were able to incorporate so many pics on this layout. I love when pics are the main focus of a page. This is wonderful! I like your quick, simple and effective approach. I LOVE your page and LOVE the "Smooch" stamp set. I'm a new member to the Studio AE stamp club and these stamps are amazing. Thank you for the chance to win. Love this layout. I like how the photos are highlighted and tell the story with the journaling supporting the photos without overwhelming them. Beautiful layout! I like the stitching and stamps. I love the 3-D accents! Thanx for the ideas! Dear Linda, your layout is so fresh and simple but so stricking. Love the yellow (not a colour we use often enough). Also great photolayout. I always need new ways to cram as many photo's onto my layout as possible, without overpowering them. Very nice layout! I'm from PA, and I love the outdoors here! Thanks for sharing! I love the yellow dragonfly on your layout! grabs my eye. The new stamp of Tech. Tues. looks great on your layout. Beautiful layout. Makes me want to go hiking. lol! I love your page and this great stamp set! Congrats and your work is great. I loved the layout and the colors you used. Love it - especially the dragonflies!! A simple yet beautiful and inspirational layout! Wow - thank you!